December 20, 2010 – Today, the Commander of the North American Aerospace Defense Command (NORAD) and executives from Google, Booz Allen Hamilton and the Marine Toys for Tots Foundation, who help sponsor the NORAD Tracks Santa Program, will join together at the New York Stock Exchange (NYSE) alongside the one and only Macy’s Santa to get people geared up to track Santa as he makes his yuletide journey. For the 55th consecutive year, the men and women of the North American Aerospace Defense Command are ready to track Santa! 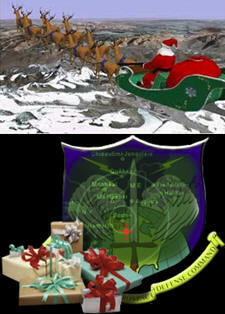 The NORAD Tracks Santa website, www.noradsanta.org, features holiday games and activities that change daily. The website is available in seven languages: English, French, German, Italian, Japanese, Spanish, and Chinese. On Dec. 24, the website will stream videos, captured by NORAD “Santa Cams,” from cities along Santa’s journey. Santa trackers will begin answering phones and replying to email at 2:00 a.m. MST (4:00 a.m. EST) on December 24 and will continue until 3:00 a.m. MST (5:00 a.m. EST) December 25. Children of all ages can then call the NTS toll-free number 1-877-Hi-NORAD (1-877-446-6723) or send an email to noradtrackssanta@gmail.com. NORAD Tracks Santa is an annual Christmas-themed entertainment program produced under the auspices of the North American Aerospace Defense Command (NORAD). Every year on Christmas Eve, "NORAD Tracks Santa" purports to follow Santa Claus as he leaves the North Pole and delivers presents to children around the world. The program starts on December 1 with a "Countdown Village" website. The program is in the tradition of the September 1897 editorial "Yes, Virginia, there is a Santa Claus" in the New York Sun. According to NORAD's official web page on the NORAD Tracks Santa program, the service began on December 24, 1955. A Sears department store placed an advertisement in a Colorado Springs newspaper. The advertisement told children that they could telephone Santa Claus and included a number for them to call. However, the telephone number printed was incorrect and calls instead came through to Colorado Spring's Continental Air Defense Command (CONAD) Center. Colonel Shoup, who was on duty that night, told his staff to give all children that called in a "current location" for Santa Claus. A tradition began which continued when the North American Aerospace Defense Command (NORAD) replaced CONAD in 1958. NORAD relies on volunteers to make the program possible. Many volunteers are employees at Cheyenne Mountain and Peterson Air Force Base. Each volunteer handles about forty telephone calls per hour, and the team typically handles more than 12,000 e-mails and more than 70,000 telephone calls from more than two hundred countries and territories. Most of these contacts happen during the twenty-five hours from 2 a.m. on December 24 until 3 a.m. MST on December 25. Google Analytics has been in use since December 2007 to analyze traffic at the NORAD Tracks Santa website. As a result of this analysis information, the program can project and scale volunteer staffing, telephone equipment, and computer equipment needs for Christmas Eve. By December 25, 2009, the NORAD Tracks Santa program had 27,440 twitter followers and the Facebook page had more than 410,700 fans. North American Aerospace Defense Command (NORAD) is a joint organization of Canada and the United States that provides aerospace warning, air sovereignty, and defense for the two countries. It was founded on May 12, 1958 (an effect of the Cold War) as a joint command between the governments of Canada and the United States, as the North American Air Defense Command. Its main technical facility has been the Cheyenne Mountain Directorate, formerly Cheyenne Mountain Operations Center, of the Cheyenne Mtn. Air Force Station, Colorado; and for this reason NORAD is sometimes referred to as Cheyenne Mountain.